Apple has today announced a major refresh to its Retina MacBook Pro lineup with 4th generation Intel Haswell processors, superior graphics and improved battery life at the Special media event at Yerba Buena Center for the Arts Theater in California. The 13-inch model with 2.4GHz Dual-core i5, 4GB memory, Iris Graphics and 128GB SSD starts shipping today at $1299 while the 15-inch version with 2.0GHz Quad-core i7, 8GB memory, Iris Pro Graphics and 256GB SSD storage also starts shipping today at $1999. During the presentation, Phil Schiller highlighted that the 13″ MacBook Pro in now thinner and lighter, weighing only 3.46 lbs and is 0.71-inch thin. It features the new 4th-generation Haswell Dual-Core processor with Iris integrated graphics, making it 90% faster than previous generation. The battery life gets a boost to 9 hours, up from 7 hours. Other improvements include PCIe-based flash storage, which is 60% faster than previous generation, 802.11ac wireless and Thunderbolt 2 ports. 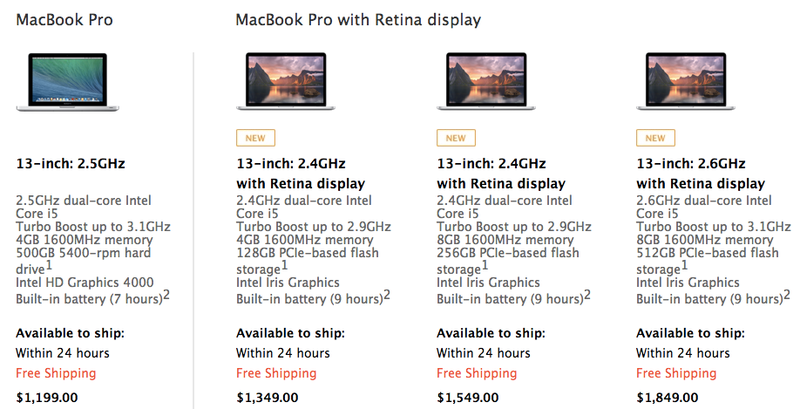 Apple has also reduced the starting price of 13″ Retina MacBook Pro to $1349, down from $1499. 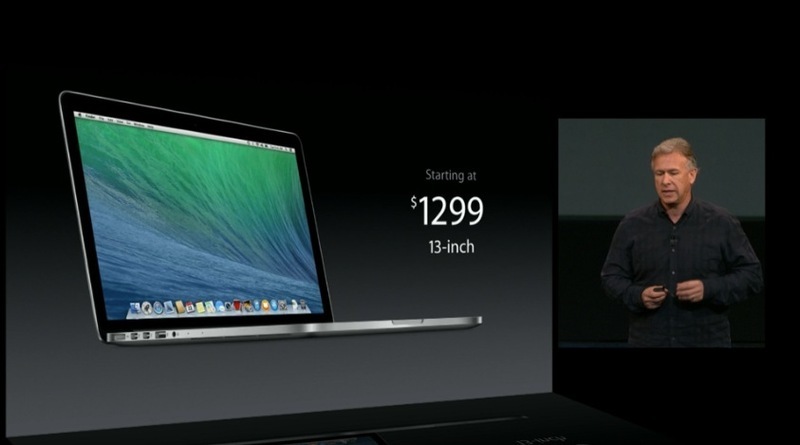 The non-Retina MacBook Pro now starts at $1,199. The 15″ Retina MacBook Pro remains the company’s top tier notebook. The 2013 model gets the new 4th-generation Intel Crystalwell Quad-core processing chip with Iris Pro Graphics and GeForce GT 750M with 2GB memory available. The battery life is now 8 hours, up from 7 hours. Other improvements include a faster 802.11ac wireless, Thunderbolt 2 ports and PCIe-based flash storage. 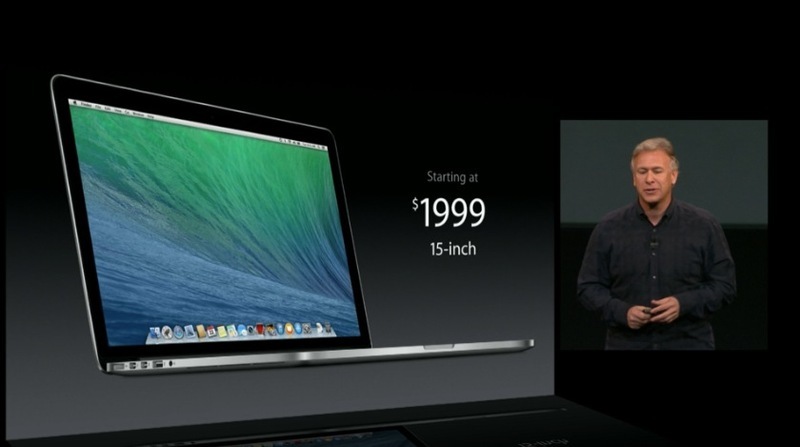 The starting price of 15″ Retina MacBook Pro has also been reduced to $2049, down from $2199 in Canada. 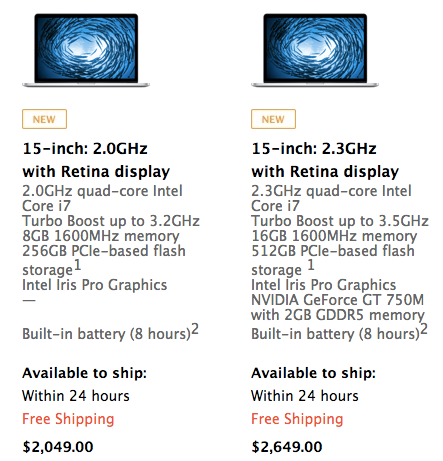 Update: Post updated to reflect Canadian MacBook pricing.